READ THESE TERMS AND CONDITIONS OF USE CAREFULLY BEFORE USING THIS SITE. This site is owned and operated by Bachelorette Parties 101 (referred to as "Bachelorette Parties," "we," "us," or "our" herein). No material from Bachelorette Parties may be copied, reproduced, republished, uploaded, posted, transmitted, or distributed in any way, except that you may download one copy of the materials on any single computer for your personal, non-commercial home use only, provided you keep intact all copyright and other proprietary notices. Modification of the materials or use of the materials for any other purpose is a violation of Bachelorette Parties copyright and other proprietary rights. For purposes of these terms, the use of any such material on any other Web site or networked computer environment is prohibited. All trademarks, service marks, and trade names are proprietary to Bachelorette Parties and/or their respective authors. This site is controlled and operated by Bachelorette Parties 101 from its offices within the State of California, United States of America. Bachelorette Parties makes no representation that materials in the site are appropriate or available for use in other locations. Those who choose to access this site from other locations do so on their own initiative and are responsible for compliance with local laws, if and to the extent local laws are applicable. Software from this site is further subject to United States export controls. No software from this site may be downloaded or otherwise exported or re-exported (i) into (or to a national or resident of) Cuba, Iraq, Libya, North Korea, Iran, Syria, or any other country to which the U.S. has embargoed goods; or (ii) to anyone on the U.S. Treasury Department's list of Specially Designated Nationals or the U.S. Commerce Department's Table of Deny Orders. By downloading or using the Software, you represent and warrant that you are not located in, under the control of, or a national or resident of any such country or on any such list. It is our policy to respect the privacy of all guests of bachelorette parties. Therefore, in addition to the privacy of questions we receive via email, we will not monitor, edit, or disclose the contents of a guest's e-mail unless required in the course of normal maintenance of Bachelorette Parties and its systems or unless required to do so by law or in the good-faith belief that such action is necessary to: (1) comply with the law or comply with legal process served on Bachelorette Parties; (2) protect and defend the rights or property of Bachelorette Parties; or (3) act in an emergency to protect the personal safety of our guests or the public. Guests shall remain solely responsible for the content of their messages. We do not sell nor give out any email information to third parties. By submitting any materials to us, you automatically grant (or warrant that the owner of such rights has expressly granted) us a perpetual, royalty-free, irrevocable, non-exclusive right and license to use, reproduce, modify, adapt, publish, translate, create derivative works from and distribute such materials or incorporate such materials into any form, medium, or technology now known or later developed throughout the universe. In addition, you warrant that all so-called "moral rights" in those materials have been waived. These terms are effective until terminated by either party. You may terminate these terms at any time by destroying all materials obtained from Bachelorette Parties (bacheloretteparties101.com) and all related documentation and all copies and installations thereof, whether made under the terms of these terms or otherwise. These terms will terminate immediately without notice from Bachelorette Parties if in Bachelorette Parties' sole discretion you fail to comply with any term or provision of these terms. Upon termination, you must destroy all materials obtained from this site and all copies thereof, whether made under the terms of these terms or otherwise. THE MATERIALS IN THIS SITE ARE PROVIDED "AS IS" AND WITHOUT WARRANTIES OF ANY KIND EITHER EXPRESS OR IMPLIED. TO THE FULLEST EXTENT PERMISSIBLE PURSUANT TO APPLICABLE LAW, BACHELORETTE PARTIES (BACHELORETTEPARTIES101.COM) DISCLAIMS ALL WARRANTIES, EXPRESS OR IMPLIED, INCLUDING, BUT NOT LIMITED TO, IMPLIED WARRANTIES OF MERCHANTABILITY AND FITNESS FOR A PARTICULAR PURPOSE. BACHELORETTE PARTIES DOES NOT WARRANT THAT THE FUNCTIONS CONTAINED IN THE MATERIALS WILL BE UNINTERRUPTED OR ERROR-FREE, THAT DEFECTS WILL BE CORRECTED, OR THAT THIS SITE OR THE SERVER THAT MAKES IT AVAILABLE ARE FREE OF VIRUSES OR OTHER HARMFUL COMPONENTS. BACHELORETTE PARTIES DOES NOT WARRANT OR MAKE ANY REPRESENTATIONS REGARDING THE USE OR THE RESULTS OF THE USE OF THE MATERIALS IN THIS SITE IN TERMS OF THEIR CORRECTNESS, ACCURACY, RELIABILITY, OR OTHERWISE. YOU (AND NOT BACHELORETTE PARTIES) ASSUME THE ENTIRE COST OF ALL NECESSARY SERVICING, REPAIR, OR CORRECTION. APPLICABLE LAW MAY NOT ALLOW THE EXCLUSION OF IMPLIED WARRANTIES, SO THE ABOVE EXCLUSION MAY NOT APPLY TO YOU. 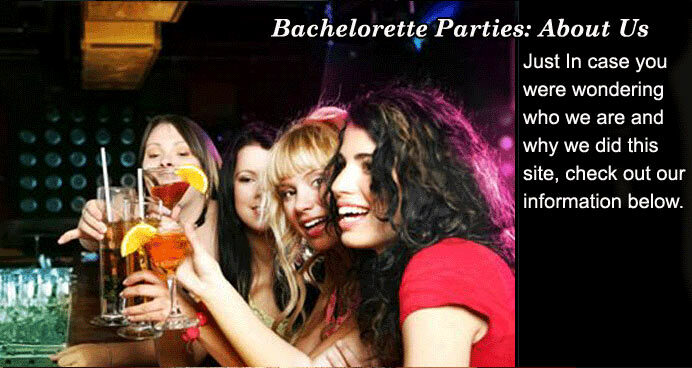 BACHELORETTE PARTIES IS AN ENTERTAINMENT RELATED SITE AND SHOULD BE USED AS SUCH. UNDER NO CIRCUMSTANCES, INCLUDING, BUT NOT LIMITED TO, NEGLIGENCE, SHALL BACHELORETTE PARTIES BE LIABLE FOR ANY SPECIAL OR CONSEQUENTIAL DAMAGES THAT RESULT FROM THE USE OF, OR THE INABILITY TO USE, THE MATERIALS IN THIS SITE, EVEN IF BACHELORETTE PARTIES OR A BACHELORETTE PARTIES AUTHORIZED REPRESENTATIVE HAS BEEN ADVISED OF THE POSSIBILITY OF SUCH DAMAGES. APPLICABLE LAW MAY NOT ALLOW THE LIMITATION OR EXCLUSION OF LIABILITY OR INCIDENTAL OR CONSEQUENTIAL DAMAGES, SO THE ABOVE LIMITATION OR EXCLUSION MAY NOT APPLY TO YOU. IN NO EVENT SHALL BACHELORETTE PARTIES' TOTAL LIABILITY TO YOU FOR ALL DAMAGES, LOSSES, AND CAUSES OF ACTION (WHETHER IN CONTRACT, TORT (INCLUDING, BUT NOT LIMITED TO, NEGLIGENCE), OR OTHERWISE) EXCEED THE AMOUNT PAID BY YOU, IF ANY, FOR ACCESSING THIS SITE. The policies below are applicable to Bachelorette Parties (bacheloretteparties101.com), a site on the World Wide Web, owned and operated by I-Volution, Inc. dba bachelorette parties 101. Bachelorette Parties collects personally identifying information only during (i) contest or sweepstakes registration and (ii) subscription registration for sites which require subscription. In addition, information is collected in certain portions of sites in which guests specifically and knowingly provide such information along with content submissions, community postings (i.e., chat or bulletin boards), suggestions, or voting. Bachelorette Parties may use such information for editorial and feedback purposes. Guests' e-mail addresses are never posted on any of the Bachelorette Parties system of websites nor used by third parties without consent from the user. Information submitted at the time of registration or submission may be used for marketing and promotional purposes by Bachelorette Parties. If a guest objects to such use for any reason, he / she may stop that use - either by e-mail request or by modifying his/her registration information online. Please let us know if you have any questions regarding this information by emailing us at bachelorette@bacheloretteparties101.com.